INDIANAPOLIS -- Police are asking for the public's help to identify one of two people wanted for questioning in connection with a violent home invasion Tuesday afternoon. 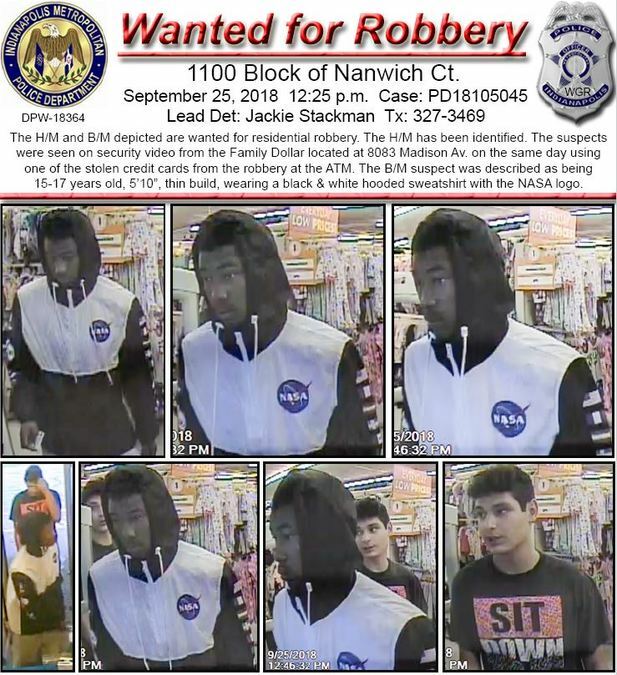 The Indianapolis Metropolitan Police Department says the two people shown in these images were caught on surveillance video at Family Dollar using a credit card that was stolen during a home invasion in the 1100 block of Nanwich Court on the same day. Police say they have identified the suspect in the bottom right corner but they are trying to identify the black teen who they believe is between the ages of 15 and 17 years old with a thin build. He was wearing a black and white hooded sweatshirt with a NASA logo on it when the images were captured. A female victim told police that two men knocked on her door around 12:30 p.m. and then forced their way inside when she answered . The victim said the men tied her and her husband up and then struck her in the head before stealing her bank cards, several items from inside and then taking off in her 2002 Jeep Grand Cherokee. If you recognize the suspect or have any information about the crime contact IMPD or Crime Stoppers of Central Indiana at 317-262-8477.